Efficient filtration and improving oil cleanliness results in important savings. Today everybody knows, and many companies implemented oil management systems for solving their contamination issues. But how can solid particles as well as water and varnish & sludge be removed? Our engineers managed to design the most efficient and effective solution available today: TRIPLE R BYPASS OIL CLEANERS! 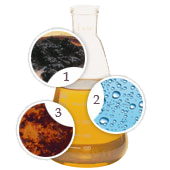 With Total Oil Cleaning in mind, our Bypass Oil Cleaners apply a very different, unique technology based on a completely different filter element setup. 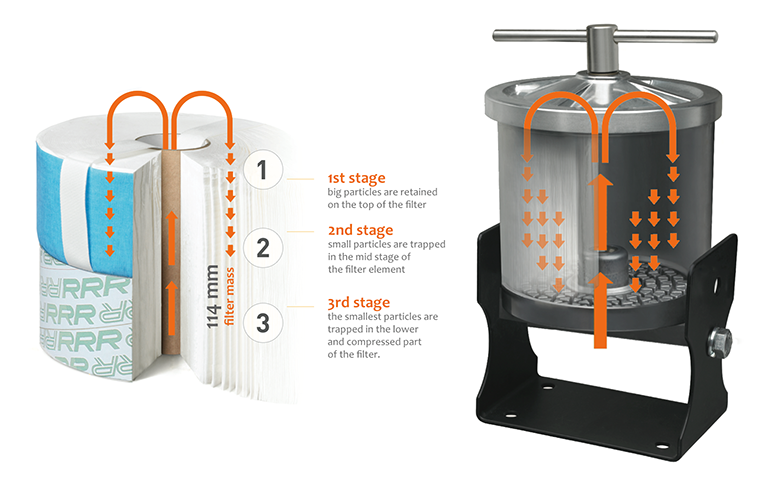 Actually the filter design forces the oil to flow through 114 mm of engineered filter media and creates 3 distinct stages of filtration. The cellulose filter media absorbs water drops and consequently dries the oil to less than 100 ppm. The industry thickest filter, 114 mm to flow through, combined with Triple R’s engineered filter media results in the ability for absorbing and removing Oil Oxidation Residues, well known as sludge, varnish and tars. All within one filter element; 3-in-1 oil cleaning efficiency. 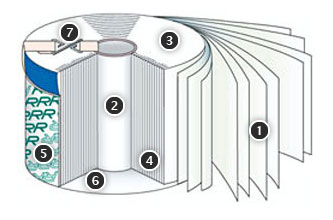 Made from a special cellulose material 1 wound onto central core 2 it combines micro and depth filtration by using the axial filtration principle (flow direction from the top 3 to the bottom 4). A card sleeve 5 compresses the lower part to increase the density. A non-woven cloth 6 protects the base and stops particle and media migration. All elements are fitted with 2 lifting strips 7 for easy removal. After a few weeks in operation you will see your dark coloured oil gradually clearing and becoming as brilliant as new. This combination of 3 features and the high level of efficiency for each make the Triple R unique in oil filtration, world-wide. Triple R bypass filters always operate in a bypass loop. Consequently, Triple R elements always operate under ideal filtration circumstances. There are 2 major reasons why Triple R bypass oil cleaners are so much more efficient and effective than inline filters. Triple R filters are always installed in a bypass loop on the machine. Meaning that Triple R filters never have to suffer from high flow rates, flow pulsations and pressure peaks and pulsations. A filter medium with a thickness of 114mm, that's real depth filtration. Now, compare that with a Pall, Hydac, Mahle, Donaldson or other inline filter. What’s is their filter mass? How thick is the filter medium the oil (and particles) has to flow through? Maybe 1 or 2 mm? That’s >50x thinner than a Triple R element! Now imagine that such a thin filter has to deal with high flow, high pressure, continuous flow and pressure pulsations... 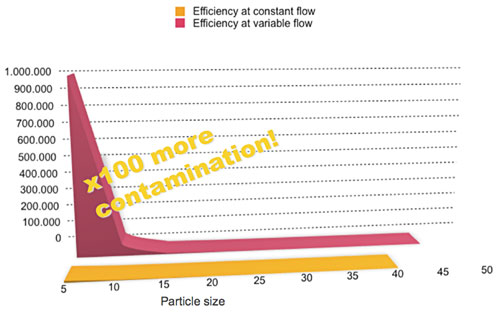 I guess it’s very obvious that in such circumstances most particles are just flushed through the filter. Be aware that micron ratings are just meant to compare different brands, but a micron rating does not give any guarantee for achieving a certain NAS or ISO cleanliness of the oil.